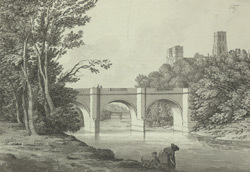 Completed in 1778, the Prebends Bridge was newly built when drawn by Samuel Grimm. Designed by George Nicholson, it served as a private road for the Dean and Chapter of Durham, giving access from the south through the Watergate. It formed the centrepiece of a classical wooded landscape and set off the imposing skyline of the cathedral. This view of the peninsula ("half Church of God, half castle 'gainst the Scot") has been a favourite with visitors ever since, and fortunately remains almost unchanged.